A y-intercept of a function is a point where the graph crosses the y-axis. That is, a y-intercept is a point where x = 0. Thus, the y-intercept of f(x) = Ax2 + Bx + C is the point (0, C). 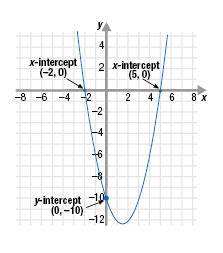 An x-intercept of a function is a point where the graph crosses the x-axis. That is, a point where y = 0. A parabola of the form f(x) = Ax2 + Bx + C may have 0, 1, or 2 x-intercepts. The y-intercept is the point (0, C). Thus, it is the point where x = 0. So, the y-intercept is (0, -10). To find the x-intercepts, replace f(x) with 0 and then solve for x. Set each factor equal to 0. 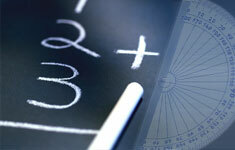 So, the x-intercepts of f(x) = x2 - 3x - 10 are (-2, 0) and (5, 0).